"Perfect combination of chocolate and mint in a beautiful presentation for Christmas." Stir crushed chocolate wafer crumbs, 1/4 cup white sugar, and softened butter together in a bowl. Press into an 8-inch pie plate. Refrigerate until set, at least 15 minutes. Pour water into a bowl and sprinkle gelatin over the top; let sit until gelatin softens, 5 to 10 minutes. Heat milk in a saucepan over medium heat until bubbling. Beat egg yolks and 1/2 cup white sugar together in a bowl. Pour hot milk into egg yolk mixture in a steady stream, whisking constantly. Return egg mixture to saucepan over medium heat and cook, stirring constantly, until mixture thickens slightly, about 4 minutes. Remove from heat. Stir gelatin mixture into egg-yolk mixture until gelatin melts and custard is well-combined; cool to room temperature. Stir in peppermint extract and vanilla extract. Beat heavy cream in a chilled glass or metal bowl until medium-soft peaks form. Fold egg whites and whipped cream into custard. Pour custard into prepared crust. Sprinkle with crushed peppermint candy and grated chocolate. Chill pie in the refrigerator until set, 8 hours to overnight. 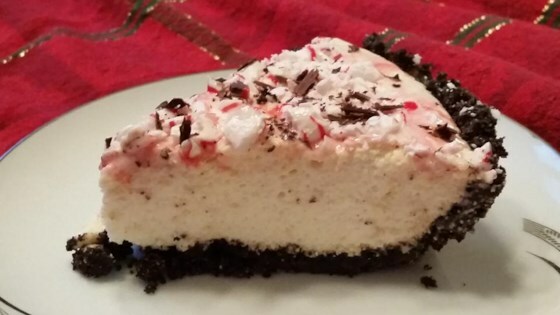 My family likes this best the next day because the candy melts and adds a lot of peppermint flavor (top of pie turns pink). I add more crushed candy to still provide the crunch. OMG, I was looking for this recipe. Found this one online. It's just like the one my Mother In Law always made.